Yep! It's 2 days from the most epic parade of all times...besides Cabot, Arkansas Homecoming parade 1999. Obviously! 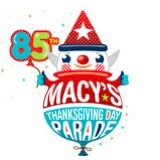 MACY'S Thanksgiving Day Parade is on in 2 days...I'm sure you all knew that b/c you all have a countdown on your fridge. I'm sure of it!